I've got a VERY quick, easy to do action against the Karl Rove GOPropoganda machine that I hope you'll let the BBBR lists in on. It literally takes less than one minute to do. The corporate media attack chihuahuas have been having a Heather snit over Al Gore's supposed "Taftian" weight gain. Let Karl Rove know you don't believe anything the corporate media says. And forward this action to every Democratic list you belong to. 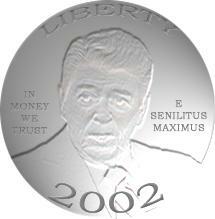 For those of you who enjoyed "The Steal Penny," here is Steve Stark's take on commemorative coinage -- Reagan-style. Doonesbury has picked up on the "Toxic Texan" moniker we used in the Crawford banner. It appears in this week's STRAW POLL. Please vote! We may be able to get Bush dubbed the Toxic Texan in the comic strip! Please pass this along . . .
ACTION: Please contact Michael Powell and let him know that media diversity should be a top priority for the FCC, and that media concentration is not in the public interest. Urge the FCC to preserve-- and refrain from weakening-- the rule prohibiting cross ownership of newspapers and television stations in the same market. As always, please remember that your comments will be more effective if you maintain a polite tone. Please cc fair@fair.org with your correspondence.